You can find it here. I think you will enjoy looking through a few of the pages. Extremely informative and excellent quality images. As for the stamps shown above. They are SG 505 - 508 and from the 1972 "Famous Australians" (4th series) issue. 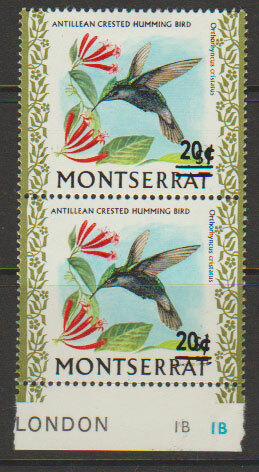 The issue was only available in 70c or $1.40 booklets and the outer edge of the pane is imperforate. These from the bottom left of the booklet. No significant catalogue value but nice to collect a one of each from the booklet pane to collect a used "pane" if possible. I have many in stock so will be trying over the coming days to get some listed in the Bidstart Store. 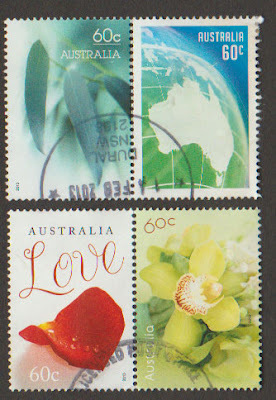 As a competition, these four above will be a prize to the first correct answer, with mailing address, sent to cddstamps@gmail.com - How many postally valid stamps were there on a booklet pane? Hello, Friday night, another week gone so fast. I hope you had a great week and found time for some stamps. Always a great way to relax I think. 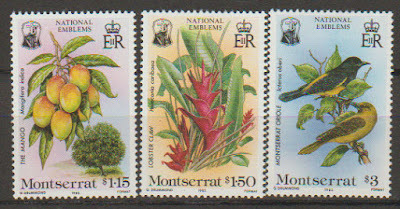 Tonight a few more stamps from Montserrat: This is the National Emblems set from 1985, SG 628 - 630, and I chose it to show you because it has a lovely image of mangoes and a mango tree. You are probably wondering why I would even think of this. Well so am I !!!!!!!!!!!!!! I know I enjoy my mango juice every morning so perhaps that is why. 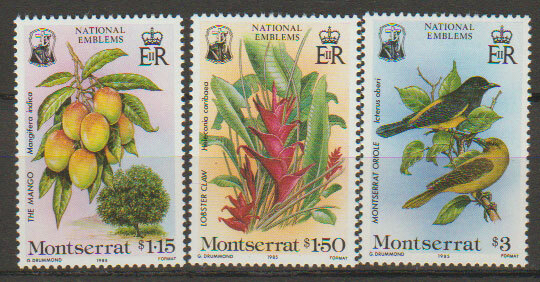 On a more serious note, this set and many more from Montserrat from the 1970's and 1980's are now available in the cddstamps Bidstart Store Enjoy looking and perhaps you will be able to fill a gap in your collection. We hope so. This is the pair SG 338 and 338b. SG 338b has bottom bar of the surcharge omitted. Catalogued at £4.75. Hello, when I last wrote I said a few days before I posted from the Philippines. Well time has certainly passed by very quickly and a few days has turned into 20 something days. Never mind, I am well and having had a wonderful few weeks with no internet I am now back online and with time to think about stamps. One thing about moving is that one finds some of those lost philatelic materials you knew you had but couldn’t find. These two se-tenant pairs were on an envelope I found while unpacking from the move. I hope you like seeing them. My catalogue only lists to end 2012 so I cannot give any catalogue details but these were issued for Valentines day 2013. I will be writing more over coming days and weeks now and, FYI, I have cddstamps back in action full time. Apology for slow responses to some emails and mailing of orders, but all caught up now.